Bowling frogs Is a great toy for your child it's bright colours and happy frog faces make it hard to ignore. This is a toy that your children love to play with and they can spend hours setting up the frogs and bowling them down. The good thing is no matter how many times they fall over the frogs keep right on smiling. 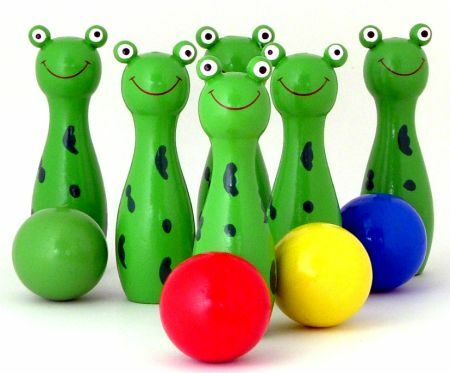 The Bowling Frogs help develop your child's hand eye co-ordination and the different bright colour balls can be used as an aid in colour recognition. These little guys are nice and solid and small hands have no problem setting them up. They are nicely weighted and stand up easily. We like this because: "The frogs are just begging to be knocked over"
Just wanted to write a quick email and tell you how pleased I am with our recent order (first time we have ordered from you). The postage was quick and the quality of the toys are just beautiful. Thank you for having beautiful timber toys at good prices and excellent shipping times. We will definitely be ordering again!! I am going to have 2 happy little boys on their birthday.